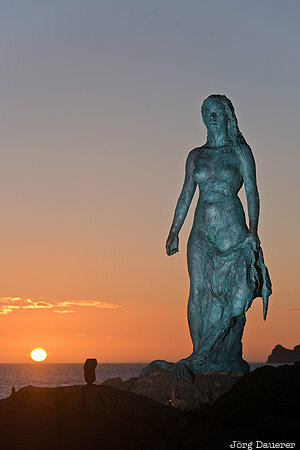 The statue of a sealwoman (selkie) in Mikladalur in front of the rising sun illuminated by a flash gun (used as a fill flash). Mikladalur is on the island Kalsoy, Northern Islands, Faroe Islands. This photo was taken in the morning of a sunny day in June of 2017. This photo was taken with a digital camera.